Chinese herbal therapy has been practiced for thousands of years. Herbal therapy used in conjunction with acupuncture increases the effectiveness of the treatment and noticeable results are obtained faster. 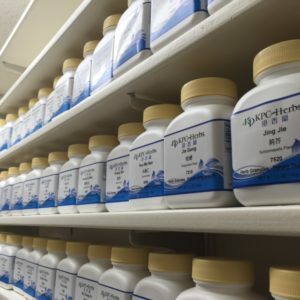 Our herbal pharmacy contains 200 different Chinese herbs in powder form. We also have pre-made formulas in pill, capsule, and tincture form. The companies we get our herbs from are certified by the FDA for cGMP (Good Manufacturing Processes), USDA Organic, and Kosher. These companies maintain high quality and safety standards, and do analysis and research on their products often. Herbs do not function the same as drugs in your body. The results of herbs are more subtle and more gentle than drugs. They work with your body naturally. Many western drugs focus on suppressing symptoms. Chinese herbs focus on clearing the root cause, and then symptoms improve, or go away on their own. Tinctures work well for kids. They are made with glycerin. It tastes sweet, like honey, and kids like it. Depending on your condition, we may prescribe a pill, powder formula, or sometimes both. The powder formulas are mixed with warm water and you sip them like you would a cup of tea. They are usually made up of anywhere from 4 to 15 different herbs.